Diego Cervo/Shutterstock. All Rights Reserved. The history of capitalism could be written through the lenses of paid care and domestic workers in private households. Constituting one of the largest sections of the workforce in most western countries from the outset of capitalism, care and domestic workers—or domestic servants as they were called in the eighteenth and nineteenth centuries—have been nonetheless widely neglected from historical accounts of free and unfree labour. John Locke used the image of a servant in Two Treatises of Government (1690) to demonstrate how labour was, at the dawn of English bourgeois society, beginning to emerge as a special type of private property. By the early 1800s, some ten percent of the English and Welsh populations were employed as domestic servants—90 percent of them were women—according to Carolyne Steedman in Labours Lost: Domestic Service and the Making of Modern England. Today, the International Labour Organisation (ILO) estimates that there are almost 55 million domestic workers worldwide, though some experts say the number could be as high as 100 million. Around 200,000 are employed in the UK, although the true number is likely higher. Yet from Adam Smith to E. P. Thompson, the history of capitalism has been written as if servants—now called domestic workers—do not exist, or do not really belong to the working population. Why has this historical erasure occurred? To find answers to this question we need to look at the features of domestic work under capitalism. 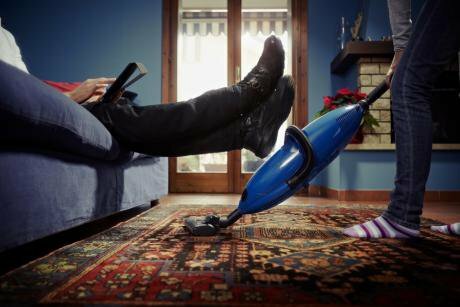 There are at least three reasons that domestic labour is not considered ‘work’ in the modern capitalist economy. To begin with, domestic workers re-produce people’s daily lives and their capacity to work but do not produce commodities that capitalists may sell for profit. This is a fatal flaw, as commodity-making activities are the only ones valued by capitalist society. On the one hand, mainstream economists define care and domestic work as pertaining to the service economy and therefore as labour-intensive and low in productivity. Like all human services, thus, care and domestic work is said to suffer from Baumol’s ‘costs disease’, which means that wages are independent of productivity and that profit margins are low. On the other hand, most Marxist economists consider care and domestic work as re-productive labour—and thus as unproductive from a capitalist viewpoint—in as much as it pertains to the sphere of production of ‘beings’ and not of ‘things’, or of ‘use values’ rather than ‘exchange values’. Second, domestic servants work in private households, which are not considered proper workplaces and thus escape working regulations and controls. As the ILO campaign ‘Decent Work for Domestic Workers’ has claimed, this general lack of regulatory oversight allows many employers to hire these workers without proper contracts, pay them less than the minimum wage, and demand unpaid overtime. Third, the work that domestic workers perform is considered ‘unskilled’. Cooking, washing, ironing, caring for the children or the elderly are all tasks capitalist society considers as mainly women’s vocational activities, rather than proper jobs. Finally, when domestic workers care for children, the elderly and the disabled, they are required not only to care for but also to care about them: that is, they are expected to love the people they mind. Such expectation, however, soon becomes emotional and moral pressure. Employers deploy this strategically in order to ‘ask’ domestic and care labourers to work longer days, or to refrain from asking for days off. Love is used to justify the robbery of domestic and care workers’ time and right to decent pay. Today’s domestic and care workers, like their servant predecessors in the nineteenth century, remain essential to western economies and societies yet they are forgotten. They are indispensable for the reproduction of our lives yet they are exploited, abused and at times treated like slaves. The fact that most are now migrants from the Global South only serves to make them more vulnerable, as they lack access to citizenship rights and are subjected to border control regimes. The Overseas Domestic Workers Visa (ODWV) in the UK is a prime example here. Overseas domestic workers are tied to their employers under the new regime, in effect since 2012, which means that they are denied the basic freedom to change employer if they no longer want to be in a contractual relationship with them. As Kate Roberts already highlighted in an article in this series, many domestic workers now have their employers’ names in their UK Visa—as if they were their property!—and risk falling into the category of illegal migrants if they try to change the conditions of their work. The UK based migrant domestic workers advocacy organisation Kalayaan has registered an increase in the reported abuse of these workers since these changes to the ODWV came into effect. As Kalayaan reports, migrant domestic workers who are tied to their employers are more likely to experience physical abuse: 71% of them have described situations of reclusion in the house where they live and work; 65% of them do not have their own rooms and some have reported sleeping in the kitchen or lounge; 53% claim that they effectively work sixteen hours a day and 60% of these workers are paid less than £50 a week. Today, perhaps even more than in the early days of capitalism, domestic and care workers continue to exemplify the condition of wage workers under capitalism: work is increasingly casualised, feminised and considered the private property of the employer who may use and dispose of it as they please. The domestic work of servants, in other words, is paradigmatic of the capitalist wage relation and the political form of the labour contract in which the employer considers the employee as their property. Furthermore, insofar as such work in contemporary capitalist societies and under neoliberalism is performed mostly by migrant women from the Global South, it powerfully shows one important way in which capitalism reproduces gendered and racial oppression, and class exploitation. Yet, the conditions of these workers have been erased from the history of capitalism, almost as if to make us forget what the wage relationship really is about: the robbery of our time, capacities, energy and skills as if they were not really ours, as if they belonged to someone else. This article has been produced within the framework of the Marie Curie funded project “Intersectional Contract. Understanding the Intersection of Gender and ‘Race’/Ethnic Inequalities in the Care-Domestic Sector in the UK by Means of Racial-Sexual Contract Analysis”. The contents of this document are the sole responsibility of the author, and can under no circumstances be regarded as reflecting the position of the EU.